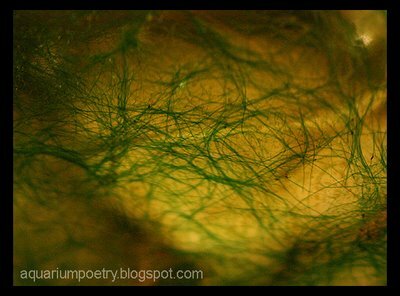 Blue-Green Algae even though called algae, is not classified anymore as one. This "algae" is actually cyanobacteria. It forms slime, blue-green, sheets that will cover everything in a short time. It can be removed mechanically but will return quickly if the water quality is not fixed. It can be treated with Erythromycin phosphate, but this might effect the nitrifying bacteria in the gravel and filter. When the BGA gets killed by the algaecide it will start to rot and through that process it will reduce Oxygen levels in the tank. Since the nitrifying bacteria needs O2 to transfer ammonia/nitrItes into nitrAtes the nitrifying process will slow down. If algaecide is used, make sure to test the ammonia/nitrite levels. Remove all the visible algae to prevent it from rotting in side the tank. Some aquarists use the black-out method, where black bags are wrapped around the tank for 4 days and held in complete darkness. It is advisable to raise NO3 levels to 10-20ppm before starting the black-out period. 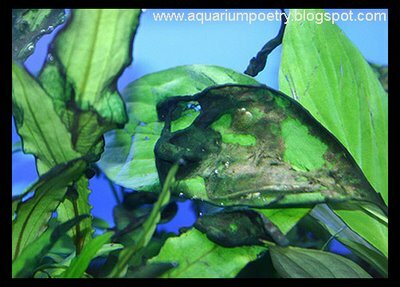 All visible algae should be vacuumed before black-out and after the black out.Egeria densa (Elodea) and Ceratophyllum demersum are good plants to have in a tank. These plants secretes antibiotic substances which can help prevent Blue-Green Algae. Establishing, lots of healthy, fast-growing plants from the day you start the tank + dosing the nitrAte levels to maintain 10-20ppm (in planted aquariums) and vacuuming the gravel (in non-planted ones), is the best way to prevent this "algae". The BGA can be found in aquariums with very low nitrates because it can fix atmospheric nitrogen. BGA seem not to like very low pH and high CO2 levels. BGA doesn't prefer strong water currents. Excess organic loading is the real cause in many cases. Try removing decaying plant material and prune old leaves that are leaking organic nutrients back into the water column.